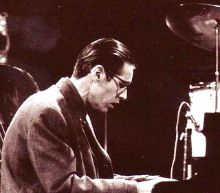 Bill Evans died 35 years ago today at the age of 51. Long before everybody dug him, his producer, Orrin Keepnews, titled a 1958 album Everybody Digs Bill Evans. The cover had autographed endorsements from Miles Davis, George Shearing, Ahmad Jamal and Cannonball Adderley. Even 35 years later, the transcendent beauty of the music of Bill Evans continues to defy rational explanation. What it was in his life that enabled him to infuse this quality into his composing, and his improvising, is a mystery that will forever defy explanation. When I was a teenager, I first heard Bill Evans while listening to Ed Beach on the radio, and was startled at how exquisite, complex and original his playing was. Last year, I wrote the following paragraph about Bill while exploring the differences and connections between jazz and Indian classical music. Brewing a cosmic sonic chai flavored with richly complex essences distilled from Claude Debussy, Maurice Ravel, pianist Nat King Cole, Red Garland, Charlie Parker and Lee Konitz, Bill Evans conjured an ambrosial rasa of luminous ecstasy, reverie, and serpentine inventive joy, which proved to be one of the most pervasive expressive sweeps in the history of Western music, transforming not only jazz, but touching just about all other musical forms of our time. His You Must Believe in Spring album was introduced to me at a seaside home in Maui, and it still evokes the interwoven breezes, moisture and ethereal pink saltiness of the vast Pacific past the currents of Shark Pit. I might add that Bill Evans was the straw that stirred the drink on the Miles Davis Kind of Blue album! I feel such a sense of peace today. For more than 35 years now Bill has been a spiritual guide for me ( my whole adult life ). I cannot imagine my life without the grace and pure beauty he brings me every day. All is love, Bill. Ms. Verchomin inspired the Bill Evans ballad “Laurie.” She wrote a book about the years they spent together near the end of his life. Hard to say anything new about a genius. He’s greatly enriched my life over the years. And of course, he had fabulous sidemen who changed the face of jazz with him. I think we are still in debt to him for all the music that he inspired directly and indirectly. Rest in peace, Bill. I met Bill in 1952 at the Washington D.C. School of Music. I was in the Navy and he was in the Army. I was also studying piano and drums at the school for 6 months after my boot camp training in Chicago. Bill played flute in the Army Concert Band and practiced piano all day. He also jammed with a bass player in the practice rooms and with a quartet at night in a special studio. No one was allowed to listen! He was a fully developed player when I heard him at the D.C. School. I was bowled over by his sense of swing and conception. I could hear the Nat King Cole, Bud Powell, Charlie Parker influences mentioned above by Mike Harris. His knowledge of classical music was encyclopedic and his sight reading abilities are legendary. He certainly displayed a singular, original mind at work. Needless to say, I went on to dedicate my life to his music which eventually led me to write two books on his musical compositions and pianistic conception. They are titled, THE HARMONY OF BILL EVANS, Volumes I and II. My main purpose was to bring his compositions to the fore and to the attention of amateurs and professionals. Both books include CDs and have been published by Hal-Leonard Corporation. It was very emotional to read all the comments above. His legacy just grows and grows with every passing year. It feels like he never left us. We have been blessed by his presence here on Earth. He truly lived music and gave of himself 200 per cent to his piano playing. Happy Birthday Bill, and RIP. Such wonderful music from such a tormented soul.